EEG Brain Signal Classification for Epileptic Seizure Disorder Detection provides the knowledge necessary to classify EEG brain signals to detect epileptic seizures using machine learning techniques. Chapters present an overview of machine learning techniques and the tools available, discuss previous studies, present empirical studies on the performance of the NN and SVM classifiers, discuss RBF neural networks trained with an improved PSO algorithm for epilepsy identification, and cover ABC algorithm optimized RBFNN for classification of EEG signal. Final chapter present future developments in the field. 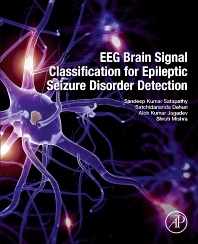 This book is a valuable source for bioinformaticians, medical doctors and other members of the biomedical field who need the most recent and promising automated techniques for EEG classification. Dr. Sandeep Kumar Satapathy is currently working as an Associate Professor in the Department of Computer Science & Engineering and is also the Head of the Department of Information Technology at Vignana Bharathi Institute of Technology. Dr. Satapathy did his doctorate in the field of Data Mining & Machine Learning, and his thesis included a detailed classification of brain EEG signals using machine learning techniques. He has been member to various academic committees within the institution. Also, he has been an active reviewer in various peer reviewed journals and presented papers in prestigious conferences. He has also reviewed many research articles and books for Elsevier for possible publication. Prof. Satapathy is highly engrossed into the area of deep learning and image processing. He has many research publications to his credit, that is more than 25 research articles, book chapters and has guided more than 10 master thesis. Dr. Satapathy has also authored a book entitled Frequent Pattern Discovery from Gene Expression Data: An Experimental Approach. He is currently member of many professional organizations and societies. His research interest includes Bioinformatics and computational approaches to biomedical field. Dr. Satchidananda Dehuri is working as an Associate Professor in the Department of Information and Communication Technology, Fakir Mohan University, Balasore, Odisha, India. Prior to this appointment, for a short stint (from Oct. 2012 to May 2014) he was an Associate Professor in the Department of Systems Engineering, Ajou University, South Korea. He received his M.Tech. and PhD degrees in Computer Science from Utkal University, Vani Vihar, Odisha in 2001 and 2006, respectively. He visited as a BOYSCAST Fellow to the Soft Computing Laboratory, Yonsei University, Seoul, South Korea under the BOYSCAST Fellowship Program of DST, Govt. of India in 2008. In 2010 he received Young Scientist Award in Engineering and Technology for the year 2008 from Odisha Vigyan Academy, Department of Science and Technology, Govt. of Odisha. He was at the Center for Theoretical Studies, Indian Institute of Technology Kharagpur as a Visiting Researcher in 2002 and 2017. During May-June 2006 he was a Visiting Scientist at the Center for Soft Computing Research, Indian Statistical Institute, Kolkata. His research interests include Evolutionary Computation, Neural Networks, Pattern Recognition, Data Warehousing and Mining, Object Oriented Programming and its Applications in Bioinformatics. He has already published about 220 research papers in reputed journals and referred conferences, has published five text books for undergraduate and graduate students and edited more than ten books of contemporary relevance. Dr. Alok Kumar Jagadev is currently working as a Professor in the School of Computer Engineering in KIIT (Deemed-to-be University), Bhubaneswar, Odisha, India. He was previously heading as an Associate Dean in the Department of Computer Science & Engineering, in Institute of Technical Education & Research, Siksha O Anusandhan (Deemed-to-be University), Bhubaneswar, Odisha, India. Dr. Jagadev has guided more than 4 doctoral students and more than 20 M.Tech students. He has published more than 30 research papers in reputed peer-reviewed journals, 4 book chapters and is having 4 books to his credits. His area of research comprises in the field of Data Mining, Bioinformatics, Soft Computing and Wireless Ad-hoc Networks. Dr. Mishra is currently working as an Associate Professor in the Department of Computer Science & Engineering, Vignana Bharathi Institute of Technology, Hyderabad and as former Head of the Department for the same institution. She was earlier working as an Assistant Professor, Department of Computer Science & Engineering, Institute of Technical Education & Research, Siksha O Anusandhan (Deemed-to-be University), Bhubaneswar, Odisha, India. She has guided 5 M.Tech thesis and more than 30 B.Tech students. Dr. Mishra has around 22 publications in various peer-reviewed journals and conference, 3 book chapters and 1 book to her credit. Her area of research is basically in Data Mining, Bioinformatics and Machine Learning. She is currently into the field of Geoinformatics and Deep Learning.